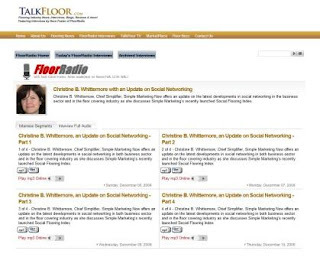 Many thanks to TalkFloor's Dave Foster who published a four part interview with me about Social Networking and the Social Flooring Index. Christine B. Whittemore, Chief Simplifier, Simple Marketing Now offers an update on the latest developments in social networking in the business sector and in the floor covering industry as she discusses Simple Marketing Now’s recently launched Social Flooring Index. As usual, a conversation with Dave is great fun and covers lots of territory! Here follow links to the individual segments with highlights of what we covered. I contrast social networking to mass communication tools; the tools are Internet based and easy to use. They are about sharing and engaging rather than forcing one-way push messages onto readers and visitors. Best practices call for integrating your social networking into your overall business strategy. Dave asked about the relevance of social media for a category like flooring - a subject that I address in How Do I Make Social Media Relevant To Categories Like Flooring? I see so many opportunities in flooring for building relationships with customers, for guiding them on how best to take care of their flooring products, etc. These social media marketing tools take us back to how business used to be done before mass communications. They allow us to connect with potential clients and share relevant and valuable information with those active in social networks. They also allow us to be digitally visible to those who seek information from a search window. The beauty of social media marketing platforms [e.g., like a blog] is that they allow you to publish your own content and address a variety of topics of interest to your audience - your history, who your people are, how you add value, your community activities, etc. A potential customer who gets to know you through your social networking activities comes into your business pre-qualified and more likely to buy than one who walks in off the street. Why? because you've had the opportunity to develop a meaningful relationship and build trust, and you maintain that relationship beyond the initial transaction. Taking part in social networking represents a long-term commitment to customers. It should be taken seriously and not delegated to interns or those without a full understanding of the business. Yes, it takes effort, but it enables you to interconnect all of your business activities, deliver on memorable customer service and make better use [i.e., repurpose] of what you create. Plan ahead and involve the rest of your organization. To be successful with social networking, you should involve the rest of your organization [e.g., Zappos is very active on Twitter] and empower your employees to deliver on company objectives and delight customers. Success requires a consistent effort, a willingness to communicate authentically in an approachable tone. You can certainly measure followers, fans, subscribers, but it's more than that. It's engaging in conversation with customers, responding to questions and referring to others. It's a way to demonstrate the value you offer and it's effective both with consumers as well as B2B customers. The Social Flooring Index monitors the social state of the flooring industry. I describe how I got started. I've broken the index into three parts: Twitter, Facebook and blogs and it's a terrific starting point for learning more about social networking, noticing patterns, and observing best practices for those in flooring and outside the industry. I explain that success with all of these social networking tools is based on sharing, providing value to your audience and engaging them in conversation. The Social Flooring Index highlights a range of efforts in social networking. It also offers an overview on the industry and how participants are evolving their efforts over time. It takes several months to build momentum, find a rhythm that works and start to generate trust and credibility. These are tools for building lifelong relationships with customers. Customers and consumers want more relevant and high-quality information, especially about flooring. Although your flooring customers aren't all actively engaged in social networks, more and more of them are - including our highly coveted woman consumer - and if they aren't, their friends and family members are ready to help them conduct digital searches. The Index continues to evolve. I intend to further segment the blog segment to take into account the subjects addressed. + 1 hour seminar titled Social Media 101 on Tuesday, February 2, 2010 from noon to 1pm. Thanks again, Dave! 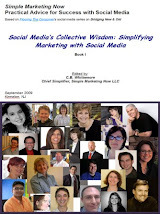 I look forward to continuing the conversation about social networking and social media marketing. I hope you get a chance to listen. I include examples and lots more detail and I'd love to hear your reactions.